Here is the third of the six paintings completed under a grant from the Haines & Friends Fund 2015 Artist Grants. Imagine you are standing on the top of the bee’s head, looking at its right eye and antenna; the other eye and antenna are behind you, out of sight. The two large compound eyes of the honeybee are made of thousands of hexagonal faceted lenses called ommatidia. Light reaches each lens at a different angle, and the bee’s brain combines the information from all these thousand of lenses so the bee sees a form as a mosaic of these thousands of dots. The ommatidia detect movement and are sensitive to both ultraviolet and polarized light. By interpreting the polarized light, the bee can orient herself to the sun’s position throughout the day. The bee also has three single-lens eyes (simple eyes) on her head that monitor light intensity. The bee’s antennae sense what our ears, nose, tongue, and skin sense: sounds, smells, tastes, and changes in vibrations, temperature, wind and humidity. The antennae fit into sockets on the head and can swivel in all directions. The ball-shaped part of the antenna is called the pedicel and it sits in the socket, or scape. The flagellum is the long, tubular part composed of ringed sections and is covered with tactile sensory hairs, pits, plaques and short spines. The bee’s sense of smell is more acute than any mammal’s sense of smell. 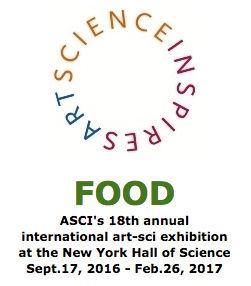 Am pleased to announce that two of my pollinator paintings were selected for ASCI's 18th annual major juried exhibition with the theme "FOOD". ASCI (Art & Science Collaborations, Inc.) was founded in 1988 by artist Sylvia Pannucci to promote artists who were producing "kinetic, light, and other hybrid works which, at that time, had difficulty being shown in the New York commercial gallery world." Art exhibitions, panel discussions, speakers' series, members' newsletters, and other events followed. At the ArtSci'98 International Symposium Nurturing Collaboration, research scientists, artists, educators, writers and representatives from science and technology industries discussed some of the following questions: "As creativity is a shared aspect of art and science, what new cultural expressions, new ways of seeing, and new insights are being developed by today's artists and scientists? 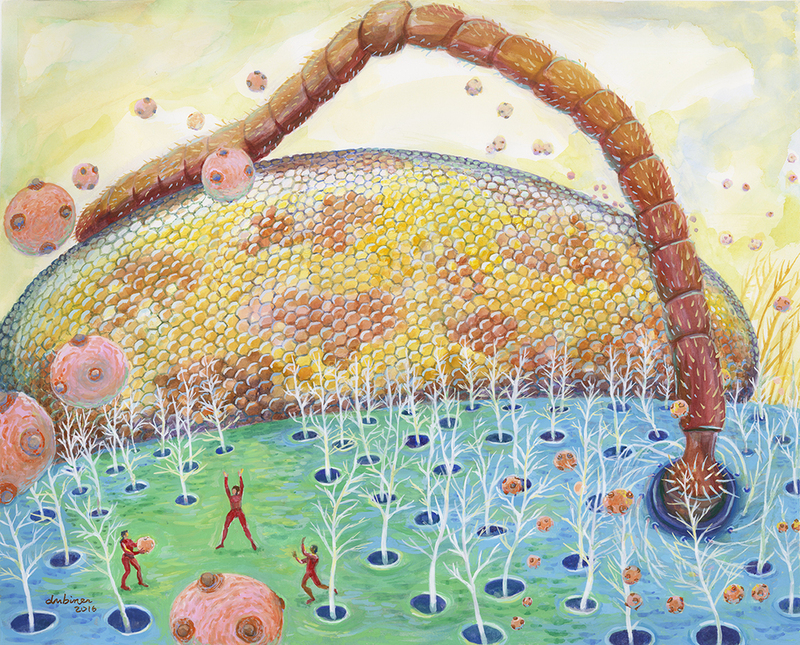 What are the ways that art and science have altered and continue to move each other? The discoveries and tools of science have had a major impact on art. How has art impacted science?" Those questions are as relevant today as in 1998. If they interest you (as they do me), check out ASCi's Facebook page. You may subscribe directly to my newsletter that sends out my latest blogs by email. Just fill in the Subscribe form at the bottom of this page. Italian cinema: "sacco and vanzetti"